This new inner city dumpling joint serves both traditional and new school parcels of joy. 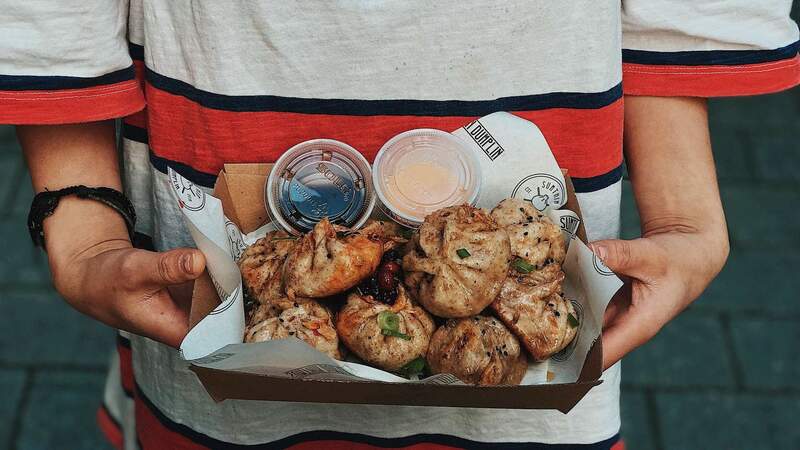 Sumthin Dumplin is the new kid on the block for Asian fusion cuisine, specialising in dumplings made fresh while you wait. Right in the heart of the city on O'Connell Street, this family-owned and operated spot is going to be your new favourite lunch location. The décor is busy without being overdone, and combines both old school Shanghai-inspired murals and a neon sign that reads 'sumthin we shoulda done a long time ago'. The statement seems authentic when you're greeted warmly by the power couple who are behind it all, it's a real family affair. There are no secrets at this place, the dumplings are assembled by 'the mother of dumplings' in a cute nook of the shop front, so you can watch the care that goes into each one as you pass by or wait for your own. If you're a traditionalist, the classic pork and cabbage combination, adeptly named The OG, is the way to go. For those ready for something new, the beef and cheese option is like a bite-sized gourmet pie, boasting both melt in your mouth mozzarella and flavourful parmesan. On a Saturday afternoon The Monk seemed to be the most popular, filled with shitake mushroom, tofu and bok choy, perfectly paired with a sriracha, chilli and peanut dipping sauce. You can choose from six or ten dumplings, fries or tofu salad on the side and a selection of soy shakes, so whether you're after a quick snack or a full meal, you'll leave feeling satisfied. The dumplings are the perfect winter warmer, but with only a few seats inside, this place is going to get even better as we approach summer. The only complaints have been that it's too popular, so the team are tweaking the opening hours to ensure you get your dumplings as fast and as fresh as possible. Keep an eye on the Sumthin Dumplin Instagram for official opening times.